VATICAN CITY — Immediately after asking bishops and religious superiors to be concrete in confronting the clerical sexual abuse crisis and the need to protect children in the Church, Pope Francis handed them a list of 21 action items to consider. Several survivors of abuse, however, expressed surprise about and unhappiness with the list. Archbishop Charles J. Scicluna of Malta, who deals with abuse cases for the Congregation for the Doctrine of the Faith, later told reporters that his office is preparing such a handbook — in a simple question-and-answer format — and it should be ready for publication within a few months. 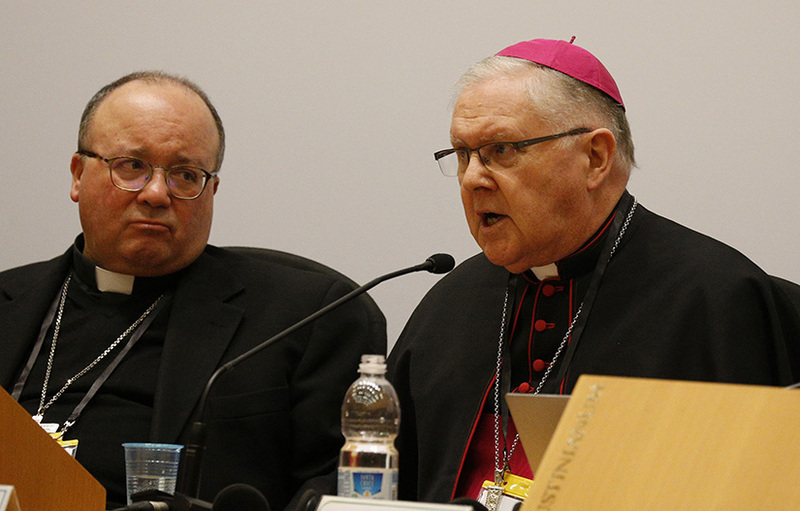 Archbishop Charles Scicluna of Malta, right, and Archbishop Mark Coleridge of Brisbane, president of the Australian bishops' conference, spoke at a press briefing after the opening session of the meeting on the protection of minors in the Church at the Vatican Feb. 21, 2019. Archbishop Scicluna insisted on the importance of involving local police and other authorities, especially because while bishops exercise spiritual authority over their priests, they have no actual “coercive measures — and we don’t have any nostalgia for the coercive measures of the Inquisition” — to force priests to cooperate with investigations and obey when punishment has been imposed. Another suggestion on the list was to establish “specific protocols for handling accusations against bishops,” a matter that was highlighted in 2018 when the public was informed of credible allegations made against then-Cardinal Theodore E. McCarrick. Participants at the Vatican summit Feb. 21-24 also were asked to discuss ways to “accompany, protect and treat victims, offering them all the necessary support for a complete recovery” and to offer healing and support to the communities where abusive priests ministered. Possible action items also included considering “penitential and recovery routes for the perpetrators” and an insistence on the “presumption of innocence” found both in natural law and canon law. Archbishop Scicluna said being accused of abuse is not reason enough to release the person’s name publicly; there must at least have been a review of the allegation and determination that it is credible. A criminal court trial or full canonical process finding the person guilty would be what consists defining the allegation as “substantiated,” he said. One item not on the list that Archbishop Scicluna said should be included is a clearer policy on keeping victims informed of the status of cases against their abusers. The canonical procedures of the Church are not criminal trials, but he said the local Church should assign someone to keep in contact with the victims as the process proceeds, and the victims have a right to be informed about the process’ conclusion. Another suggestion on the list was that the Church “observe the traditional principle of proportionality of punishment with respect to the crime committed,” including when deciding whether “priests and bishops guilty of sexual abuse of minors leave public ministry” or are dismissed from the clerical state all together. Also on the list was the idea of changing the Code of Canon Law “to raise the minimum age for marriage to 16 years.” The current code says the minimum age is 16 for males and 14 for females, but bishops in many countries have passed particular laws, approved by the Vatican, that establish 16 as the minimum age for both. Apparently in some parts of the world, the sexual abuse of a 14- or 15-year-old girl is not considered abuse of a minor since she is old enough to marry. However, in cases of clerical sexual abuse, current Church law defines a minor as any person under 18 years of age. Leona Huggins, who represents the survivor’s network, SNAP, in British Columbia, told Catholic News Service that she found the list of suggestions to be “absolutely shocking,” especially because she and the 11 other survivors who met with the summit organizing committee Feb. 20 were there to have their voices heard. None of their suggestions made it onto the list, she said. Their first priority is to get the Church to mandate a policy of zero tolerance for abusers and those who cover up their crimes. She and another survivor were especially struck that the first item on the list was producing a “handbook” when “I think we all know what the right thing to do is” when an allegation is made that an adult has raped or assaulted a child. Read the full list of reflection points here. The summit's website includes more resources and updates from the summit.